Return to the Alexander Valentine Hotel in the bonus chapter! Enjoy exclusive wallpapers, concept art, music, and screensavers. Earn achievements and find fun collectibles! 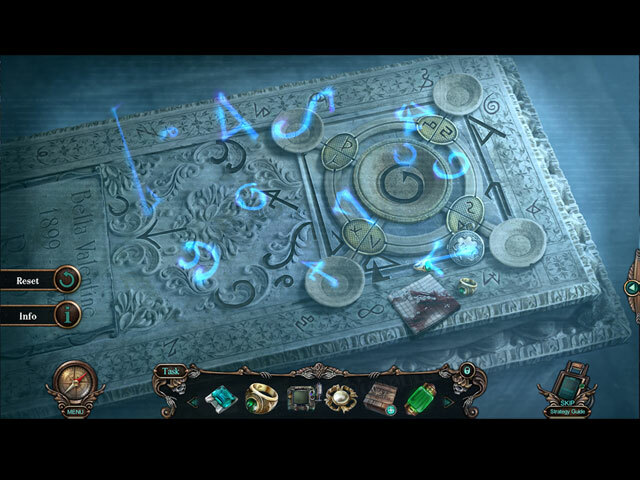 Test your mettle in the Secret Room. 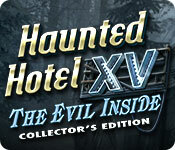 Haunted Hotel: The Evil Inside Collector's Edition is rated 3.8 out of 5 by 20. 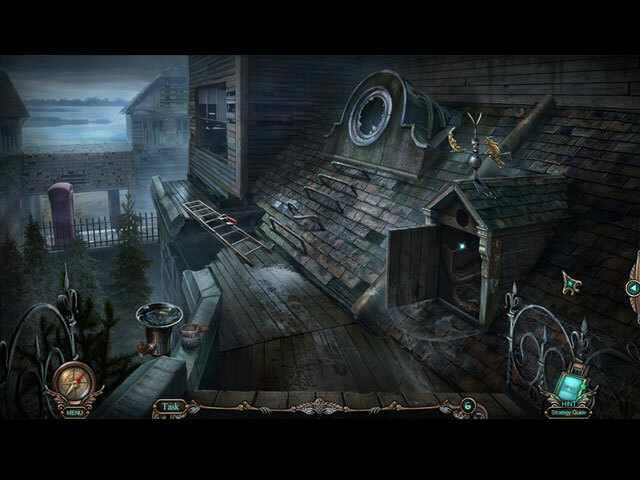 Rated 5 out of 5 by Kimmycoo from Really Great Game I loved this installment into the Haunted Hotel series. The bonus material is the reason I bought the Collector's Edition. I loved finding the picture pieces, the morphs and the collectibles. I cant leave out the achievements too. I love when the achievements are objects in a room. This game was very nicely set up. Great mini games and I loved the HOS where you match objects. Great story line-modern and current-ghost hunting. I highly recommend. A nice long game too! Rated 5 out of 5 by pjc79 from Hours of entertainment I found this game to be just the right amount of challenge for late night playing. Rated 5 out of 5 by domicol from Super game Wonderful game with plenty of soc , attractive mini games , good and understandable story , all the fun you could want , very recommended . Rated 5 out of 5 by scoobydoo2272 from Not for the faint of heart!! The spooky hotel and and eerie surprises keep you guessing on the edge of your seat! The graphics are awesome and the story line lends to the overall gaming experience. Love this game series!!! Rated 5 out of 5 by EzgiMelody from Good !! I Liked it, it is good but Somehow Scenario ( Storyline ) can be a bit different I think. Thank you Elephant Games and Big Fish. Rated 5 out of 5 by pennmom36 from WELCOME TO THE HOUSE OF SLAUGHTER The Ghost Seekers have invited a special guest host on their latest paranormal investigation of the Alexander Valentine Hotel. Rachael Collins didn't have to pull any strings to have her cousin join the team however, because James is certainly no stranger to the paranormal field, especially when it comes to Haunted Hotels! By the time James arrives, the entire team has disappeared, and he soon realizes that this Hotel holds many secrets, and even more haunted ghosts. The XV Hotel gained a seedy reputation long before it became a Hotel, dating back to 1927, when the entire Valentine family was found viciously slaughtered! Now James is left with no choice but go it alone, to save his cousin from the Evil Inside! I was a tad bit disappointed with this 15th edition of one of my favorite series, Haunted Hotel. I own every game in this series, including the 3 original Haunted Hotel games that are only available in Standard Editions. I was disappointed that after the last 2 incredibly epic storylines, they took a step backwards, with just a run of the mill plot. I still love this game, but it pales in comparison to the last two games in the series. The second disappointment I have with The Evil Inside, is that for some reason, these devs decided to offer a stupid gimmicky device called Patrick, an acronym for Paranormal Activity TRacker & Interactive Computing Kernel. Why oh why, oh why did they have to do this to my beloved Haunted Hotel??????? At least they didn't mess with the CE bling, HH never disappoints, because I can count on the fact that they offer some type of Morphing Objects, and always in the game locations NOT within the HOP's which is a feature I loathe.There are also 20 hidden Puzzle Pieces that will form 4 different Screensavers when all have been found. There are also hidden Collectible Business Cards to find as well the usual Achievements to earn etc. 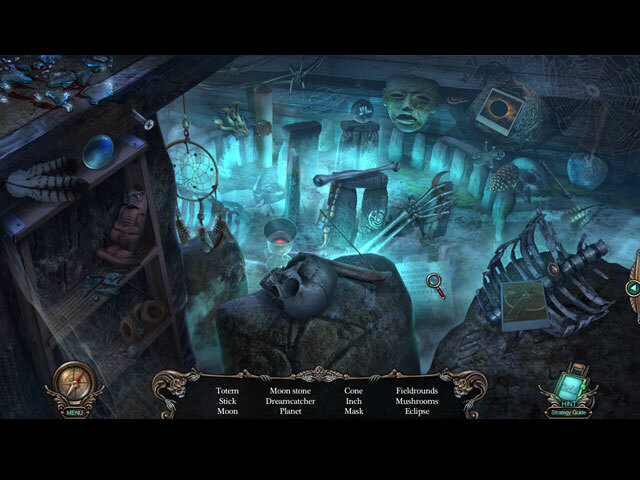 The Hidden Object Scenes vary with each one, with Interactive List Finds, Interactive Silhouetted Shape Finds, Listed Items that uncover Fragments, and one of my personal favorites, where you move objects two at a time, to Match 2 of the same items hidden within. There isn't an alternate to the HOP's, but they are fairly well done HOP's. The Mini Games are all doable, although a few of them are fairly time consuming. Below are brief descriptions of some of the games you'll encounter during the demo: 1) Reveal only the symbols that are shown on the left by flipping tiles, clicking on one tile may affect others. 2) Use Patrick to scan the scene for 7 orbs that can't be seen with the naked eye. (this is me shaking my head <<O>>) 3) Move the knobs on Patrick to focus the image. <<0>> 4) Align the image shown on Patrick with the correct location in the scene. <<0>> 5) Place metal pieces on the disk so that all of the cells are filled, using the rotation button to correct the angle of the pieces. 6) Use directional arrows to guide the ball through the maze. 7) Restore the image by moving horizontal and vertical puzzle strips on Patrick's screen. 8) Find 7 more hidden orbs using Patrick <<0>> 9) Swap adjacent tiles to restore the image shown on Patrick. 10) Swap adjacent tiles in yet another Patrick game <<0>> 11) Direct arrows so that the 3 balls will land on the top spaces at the same time. 12) Move picture pieces into the correct spots using arrows to rotate the pieces that will rotate each time they move over a circle. 13) Move the tiles to adjacent empty slots to reveal the compartment. HAUNTED HOTEL GAMES AVAILABLE Title***Collector's Edition Release Date***Average Rating 1-Haunted Hotel (SE only March 2008) 2.9 2-Believe The Lies (SE only January 2009) 2.7 3-Lonely Dreams (SE only September 2010) 3.2 4-Charles Dexter Ward (June 10-12) 3.9 5-Eclipse (October 10-13) 4.1 6-Ancient Bane (May-29-14) 3.9 7-Death Sentence (December 18-14) 4.1 8-Eternity (April 25-15) 3.7 9-Phoenix (August 20-15) 3.7 10-The X (November 12-15) 4.3 11-The Axiom Butcher (April 30-16) 4.1 12- Silent Waters (September 17-16) 3.7 13-The Thirteenth (December 24-16) 3.6 14-Personal Nightmare (May 25-17) 4.1 15-The Evil Inside (September 30-17) This Collector's Edition has 10 Wallpapers, 10 Concept Art pictures, 4 Music Soundtracks, 19 Achievements to earn, Collectible Business Cards, 25 Morphing Objects, 20 hidden Picture Fragments that give you 4 different Screensavers when complete, a Secret Room, 12 replayable Mini Games, 15 replayable Hidden Object Puzzles, a built in Strategy Guide and a Bonus Chapter to return to the Hotel, assuming you make it out alive! Enjoy your stay! Rated 5 out of 5 by 1955raven from WHAT AWAITS YOU IN THE BONE ROOM? IN THIS SPINE TINGLING NEW HAUNTED HOTEL ! THE DEMO ONLY LEFT ME WANTING THIS GAME! Rated 4 out of 5 by Majestyx12 from A Good Game Lots of Extras- 25 Morphs, Collect 20 picture parts that make 4 pictures (no assembly required) Collectibles are business cards and paintings. They didn't say how many. I guess I could have counted them on the guide but I did not. I found 13 of these. I had fun for most of the game but around the 5th chapter I noticed I had a lot of places to put items into. Then I was thinking it was this way for at least 2 chapters back. Then I counted 11 places that I had things to do, mostly put in the missing shapes. I was in the game alone most of the time and didn't have videos to add spice. Mostly just plugging along. The extras and the Hops were the saving grace. My favorite Hop was in the main story and it was a beautiful stained glass window. The bonus chapter on had 4 hops. The bonus game adds to the story. I did notice some thing was different with James but I can't figure out what. I'm a Hops girl and this is a hops game so I skipped most puzzles but I did find a few I liked-pool balls, maze and shooting the ghost creature. You can replay 15 Hops and 12 Mini-puzzles. 10 Wallpapers, 10 Concept Art, 4 Screensavers, 4 Music and lastly Achievements.